Heyo! I think this is my first official fall post. I had to wait until it was officially fall to start posting about this new season (although I feel like I'm the last blogger in the world to have something fall-related up!). Nothing like a change of seasons to get you in the redecorating spirit though, so on Sunday, I spent a relaxing chunk of time styling our "mantel" in our apartment. Why did I put mantel in quotes you might ask? Well, it's because our itty bitty city apartment doesn't have a true mantel, so I use the top of the old jelly cupboard we got from my grandparents as a makeshift mantel. The piece is a focal point in our living room just like a fireplace mantel would be, so it totally makes sense to me! 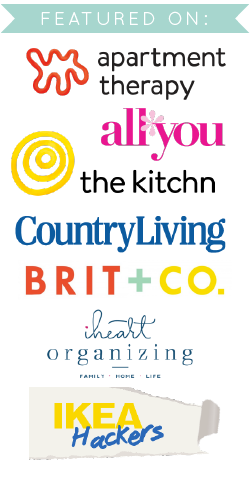 I love changing things up on it, and each season brings a new chance to be creative with it. I'm not one to really decorate thematically - I'd rather bring in a few subtle seasonal items slowly over time. When fall rolls around in September I add in more texture and layer various items to bring in some warmth to my decor.Once October hits, I'll add in a pumpkin and maybe some burlap and call it a day :). So even though there's no "theme" per se, I did choose a basic color scheme for the major components: whites, silver and clear glass - then I added color in bite size pieces. One of the great parts about this look is that I shopped my house for everything - not a dollar spent here! Hooray. I'll bet you've got plenty of things around your house you could use for something like this too. Just start playing around and see what happens! 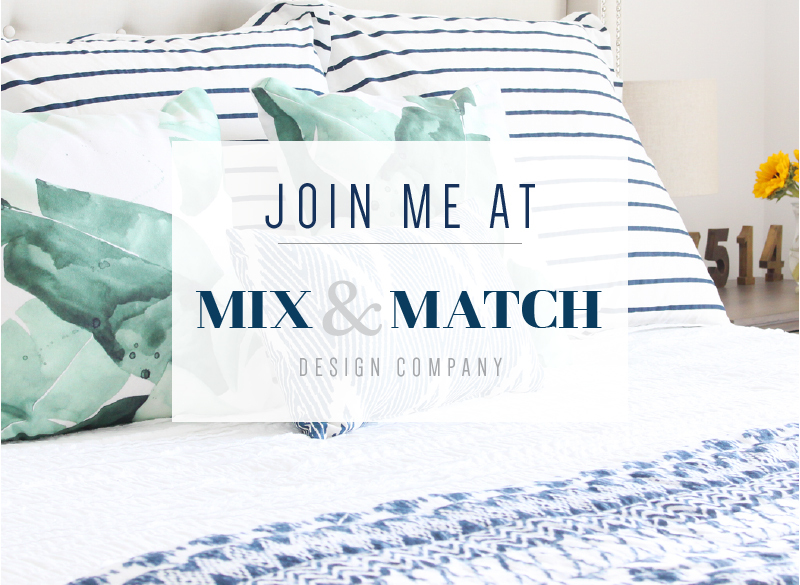 Let's start at the bottom with fabrics...I layered two: a nubby off-white table cloth (folded in thirds) on the bottom followed by a piece of powder blue and off-white chevron (it's this Premier Prints Zig Zag fabric in blue/natural *affiliate link). On top of that sits my big ole rectangular white ceramic platter with a stack of books I covered in brown kraft paper to give them a cohesive look (the covers are REALLY bright colors normally!). The brown was feeling a little blah on its own though. It needed a little something "extra" so I added strips of pretty yellow diagonal stripe washi tape to each edge. Here you can peek in on the original colorful book covers from the sides. 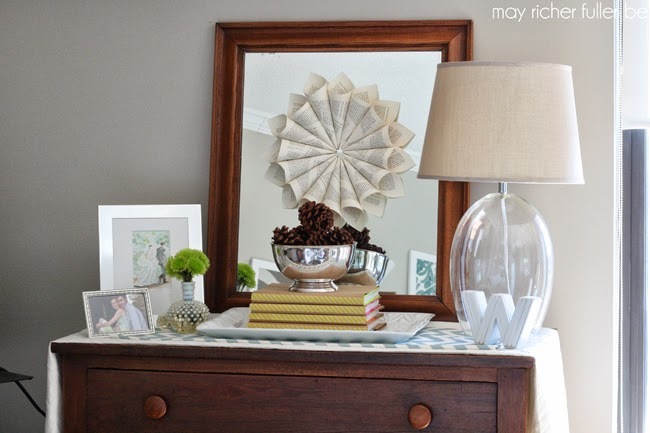 I've gotta say though, my two favorite parts of the mantel are the silver bowl with the stack of pine cones and the book page wreath I stuck on the mirror. You might recognize that wreath from my 5 Days of Book Page Crafts series I did back in August. I'm glad I held onto it, because it works perfectly here! 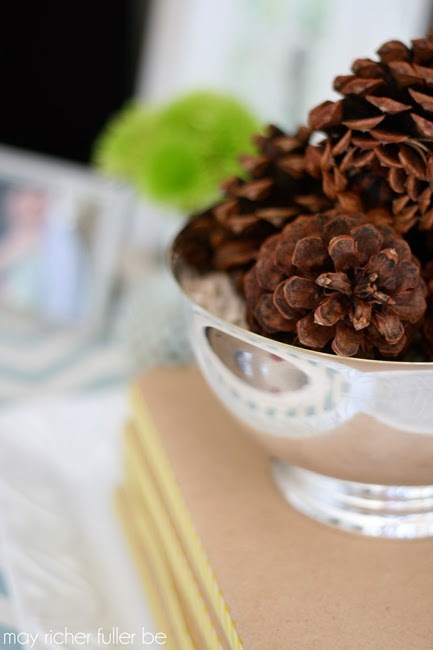 The reason I love the silver bowl full of pine cones is because I really like the contrast between the rustic, natural look of the pine cones and the refined "formal" feel of the silver bowl. 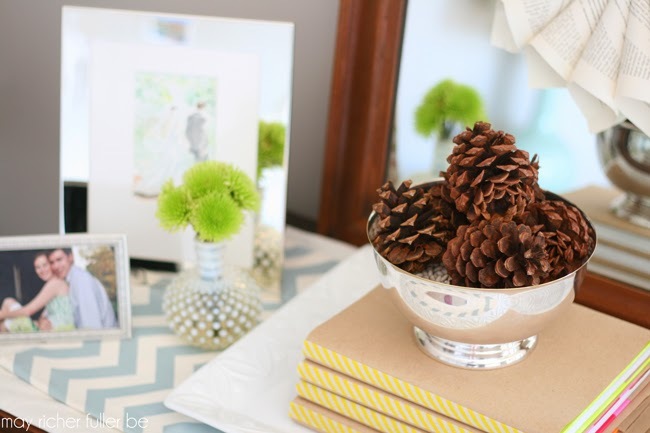 When they're together, the pine cones get dressed up a bit, and the silver bowl takes on a more casual vibe. I guess opposites really do attract, huh? 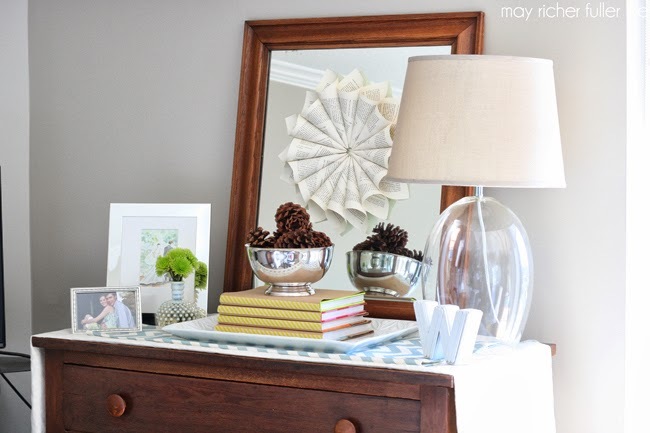 How are you transitioning your decor for fall? 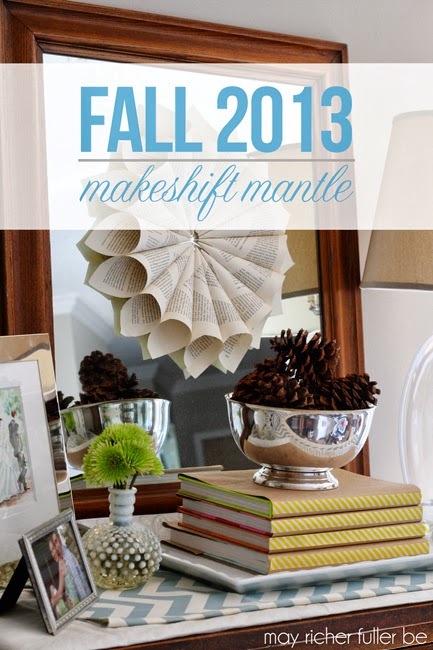 Any of y'all dressing up your mantels (or putting together a makeshift mantel like I am)? You're vignette is very chic, it looks amazing.I have a pretend mantle too. Thanks so much Karen! You're very sweet. Glad we can make the "pretend" mantles work, right!? I love it! 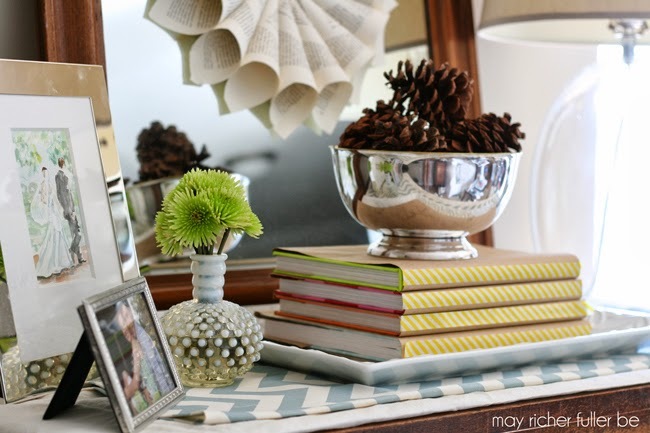 I especially love that silver bowl with the pinecones. It's just beautiful. New follower! Thanks for sharing. I look forward to upcoming posts! You are very creative and I love your "pretend" mantle. 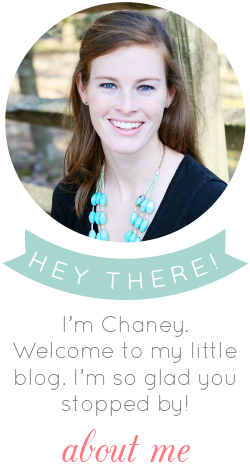 I'll bet your itty bitty city apartment is very special. Just beautiful ! 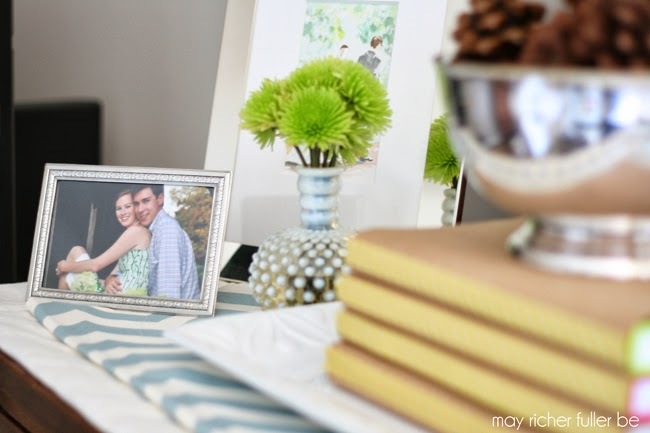 Love how you decorate your "mantel" . 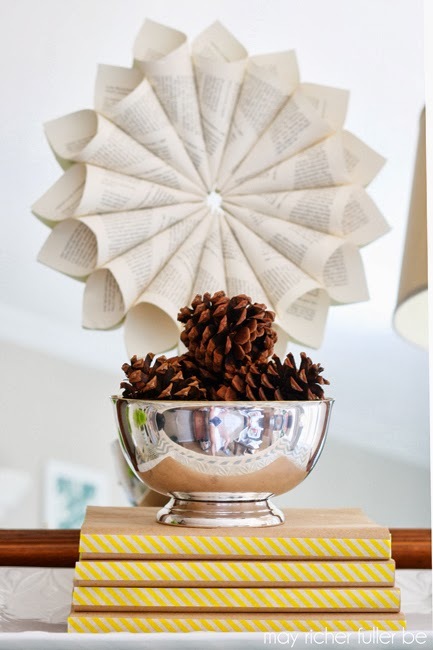 love how you cover the books with yellow-ish and make them as a base for those silver bowl with pine cones. Great job ! Just beautiful. I love how you decorate your "mantel". 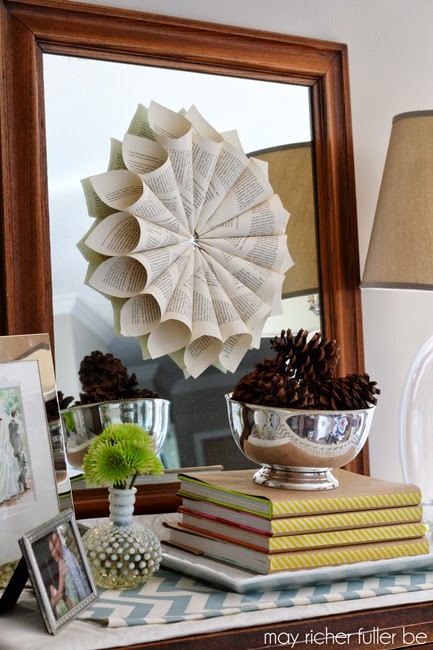 Love the covered books as a base of your silver bowl with pinecones. Great job ! Thanks Marlin! You're so sweet :). Have a great weekend! the books covered like that looks great. I don't have a mantle either, I just use a hall table and tv stand!